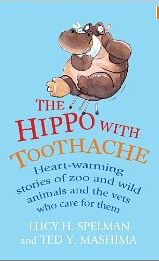 This book, subtitled Heart-warming stories of zoo and wild animals and the vets who care for them, contains a number of anecdotes told by zoo and wildlife vets. The memoirs are grouped in subjects, each one introduced with a short chapter by the editors, Lucy H. Spelman and Ted Y. Mashima. The stories are ‘in their own words’ tales and as one might guess they vary considerably in style and quality of writing – the contributors are working vets not writers. All of them are more detailed than they would be if written by a journalist or other non-vet, and it is in the detail that a lot of the interest lies; the best ones give the feeling of peering over the vet’s shoulder while the patient’s ills are diagnosed and treated. Even the ones that read like a report rather than a story have the frisson of authenticity. My knowledge of the veterinary world has been greatly expanded. I didn’t know that moray eels could mope, or that a goldfish might need surgery, or that a rhino could suffer sore feet, or that any of these things could be and would be dealt with in a day’s work by anyone. Whether tracking a herd of elephants in order to treat an injured one, caring for a stranded dolphin, or getting an orphaned fawn back on its feet and into the wild, these people go to extraordinary lengths to help their fellow creatures. Thank you for stopping by and commenting. It’s amazing, isn’t it, what one can learn from an afternoon’s reading.